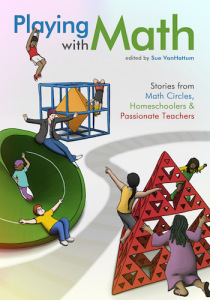 For this special episode we discuss the book ‘Playing with Math‘ edited by California Math Teacher and blogger, Sue VanHattum. We discuss details of the book (to be released, fall 2014), the inspiration behind the book as well as the questions it poses and the implication it has for progressive mathematics education. This 328-page book was 5 1/2 years in the making. It’s ready to head to the printers now, and can soon be in your hands. This entry was posted in Uncategorized on June 26, 2014 by Adrian Pumphrey. This week we are joined by Tucson math teacher, Daniel Schneider better known in the twitter/bloggersphere as Mathy McMatherson. In Daniel’s relatively short time teaching he has built up a strong following and is known for his thoughts and ideas to do with assessment, feedback and standards based grading. 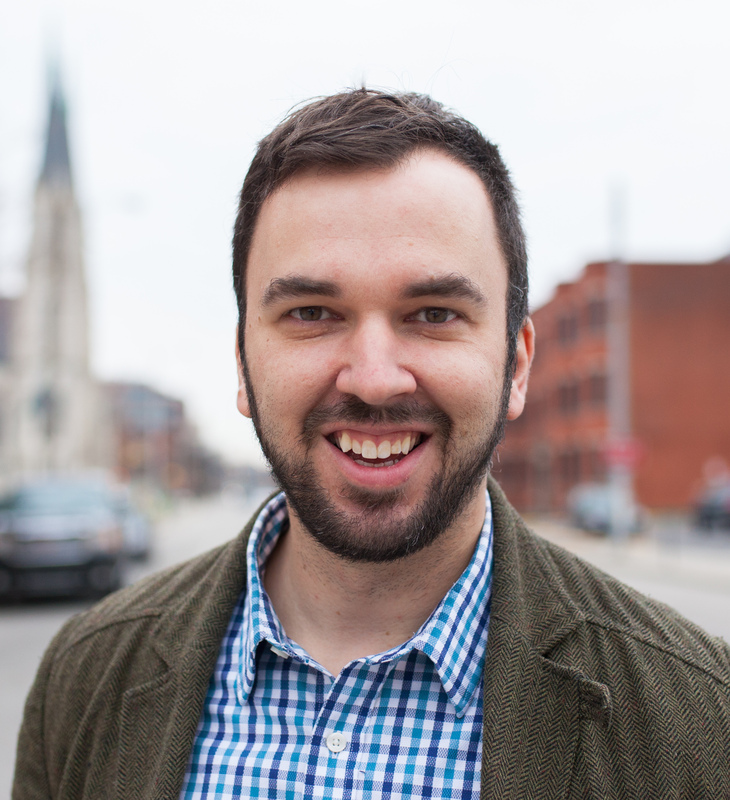 We talk to Daniel about all of the above as well as the implementation of common core across the US. This entry was posted in Uncategorized on June 2, 2014 by Adrian Pumphrey. I am looking forward to (hopefully) ‘catching’ middle school students with the wonder of mathematics before they reach high school. The most upsetting thing I hear is when students enjoyed math at elementary level but then got completely put off before they reached high school. I hope to do something to make sure this doesn’t happen for my students. I am looking forward to teaching just ‘Math.’ I have enjoyed focusing on Algebra and Probability & Statistics but have missed having the time to make connections between the disciplines. My aim will be to blur the lines between algebra and geometry so that students have a very strong sense of the link between them. Experience tells me that middle school math lends itself to Project Based Learning (#PBL) fairly well. This is something close to my heart and I look forward to modelling what it means to be a mathematician to my students. I am truly grateful to Herron High School for trusting me to teach their students for the last two years. 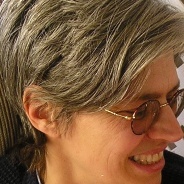 This Episode we are joined by director of Nrich, Lynne McClure. 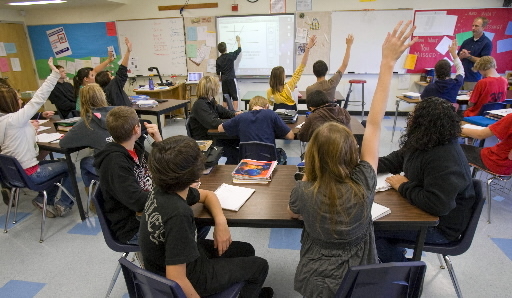 NRich is an organization dedicated to the use of rich mathematics in the classroom. In 15 years, they have built up a strong global following and now get over 500,000 hits on the website nrich.maths.org every month. 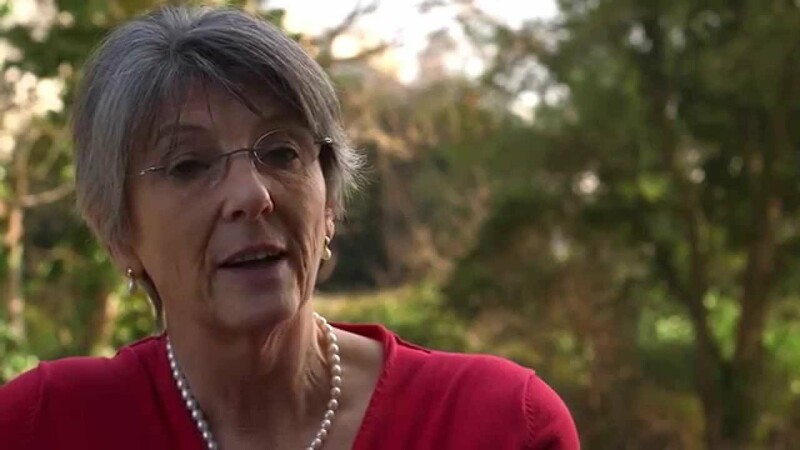 Lynne has been director at NRich for the last 4 years and is president elect of the UK’s Mathematical Association. She talks to us about the best way to use NRich activites in the classroom as well as recent developments in mathematics education. This entry was posted in Uncategorized on May 2, 2014 by Adrian Pumphrey. The challenge was given 3 months ago, on the ‘Exlpore the Math-Twittershpere-Bloggosphere’ website to create your own virtual fling cabinet: a place where all of your favorite activities are listed in one place and is easily accessible. With all the snow days we have had I have finally got round to at least writing a list of websites I am excited to trawl in the name of finding the best, most useful and inspiring activities, out there. I’m sure there are many more great sites out there that I am missing. What would you add? This entry was posted in Uncategorized on February 6, 2014 by Adrian Pumphrey. The idea is simple. Get a group of pioneering Math teachers in a room to share what works in their classroom. Add coffee and breakfast and you have a recipe for great teaching and learning. I am proud to be co-organizer of MathEd Out Indy 2014 which will be held on the morning of Saturday 8th February 9-12am at Herron High School in downtown Indianapolis. There will be no presentations or talks, just a place to share and hear from years of experience around the table. I’m excited and hope you can make it. Reserve your place soon to avoid disappointment. This entry was posted in Uncategorized on January 15, 2014 by Adrian Pumphrey. Here is a (by no means exhaustive) list of the main things I like to consider before seeing any students. What do you like to think about before lessons begin? Can you think of any holes in my basic considerations? This entry was posted in Uncategorized on August 8, 2013 by Adrian Pumphrey. Mathematics students need to practice mathematical skills. That much is certain. What I am trying to do in my classroom is to get away from the here-are-20-questions-go activity that puts shivers down the spine of many students. So how do I still help them to practice but in a less monotonous way? 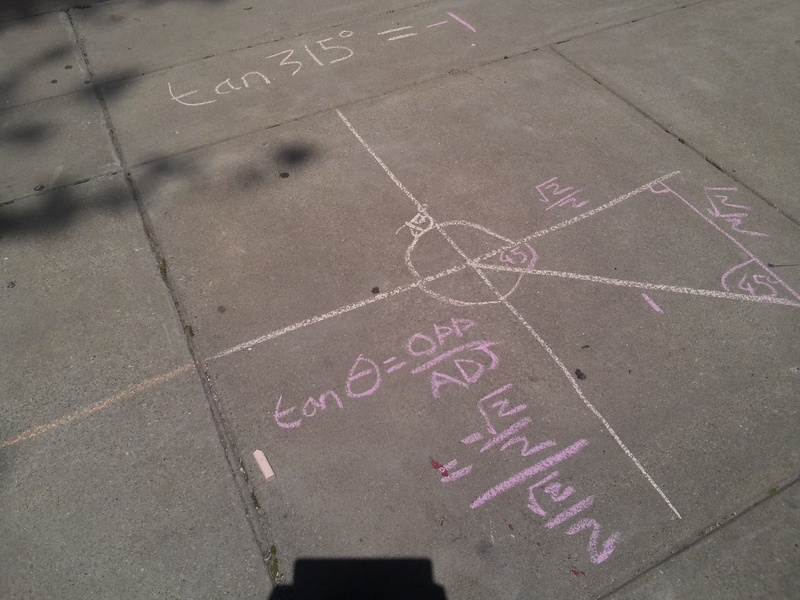 A simple idea, now that the weather has improved, is for the students to do the same problems but using sidewalk chalk to decorate the school’s pathways with beautiful math. There is something in this that appeals to the 3-year-old in all of us. The lesson objective was clear: To prepare for the quiz on 1) Solving triangles and 2) Using the unit circle to find trig ratios. We wandered outside and went for it. Most students enjoyed the lesson with a handful opting to carry on with a paper worksheet. At the end, students fed back that they enjoyed working outside. I loved the instant assessment. It took very little time to see what was going on in the students minds. It also kept the accountability high. 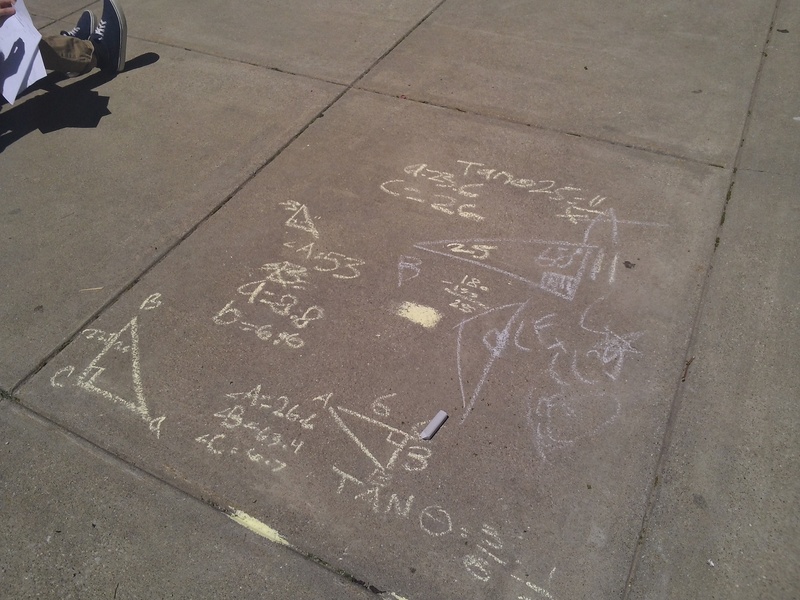 It is difficult to a student to fake writing their work on a sidewalk and check out. It would have been useful to have a little more structure to the activity than just going through the worksheet but on the sidewalk. Perhaps assigning roles, for example, scribe, coordinator, calculator. The sun was hot meaning that students became lethargic towards the end of the lesson. Choose a shaded spot if possible. This entry was posted in Algebra II, Pedagogy, Trigonometry, Uncategorized and tagged Escape the worksheet on May 14, 2013 by Adrian Pumphrey. Last week ‘The Atlantic’ website published an article on how little, mathematics is used at work. First of all an admission. Yes, there are not going to be many students who end up using complex numbers in their place of work. There will not be many who have to use trigonometry. However I believe this article completely misses the point of what mathematics education is all about. It just highlights the view of math that we see much of society holding, today. Why do colleges and employers still look out for those with at least some mathematical competency? What do they see that this article is missing? Many would say that Math is about problem solving. I agree, that is involved. I think it goes far deeper than this, however. Mathematics is about the ability to see a pattern in the world (often between two or more changing variables) and to take it into the abstract to communicate this pattern and to be able to predict what may happen into the future. This principle is used in pretty much any job you could think of. When everything stops changing, perhaps then we can shelve math education and just look at what is. I don’t think this will happen any time soon, though. This entry was posted in Uncategorized on May 2, 2013 by Adrian Pumphrey. This site used to be mainly for students. They now use the Haiku LMS system and I have decided to use this for the purpose of posting some of my more successful lesson ideas and resources. Please feel free to make comments and I welcome contributions from other educators. I would really like to make this site very searchable so that everyone can find things quickly. I will not be posting former lessons but only resources created as I go. That way it will be the best and latest of what I have to offer. I hope you find the resources and ideas as useful as I will creating them. This entry was posted in Uncategorized on March 26, 2013 by Adrian Pumphrey.